In so many jeepney rides I had, it was my first time to be able to experience being alone in a jeepney from where I came from towards my destination. 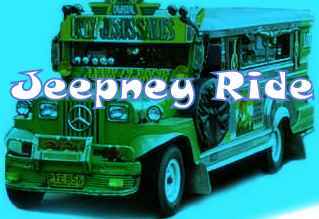 Usually if you are the only passenger, jeepney drivers would request you to transfer to another jeepney so that they could return back to their route and stay for a while in places where they could pick up more passengers. During my ride, I was already expecting that the driver would tell me to transfer to another jeepeney but he did not do so. I would really understand if he will request me to transfer because fuel now is so expensive that the driver's collected passengers fares must surpass his fuel expenses. It is only practical that in every route he does, the jeepney must be full of passengers. The experience of being a sole passenger is memorable since it doesn't happen in every ride but it is somewhat with guilt because I know that driver is not earning in that situation.